Clayton Kroh is a veteran of the videogame industry and a fiction writer. 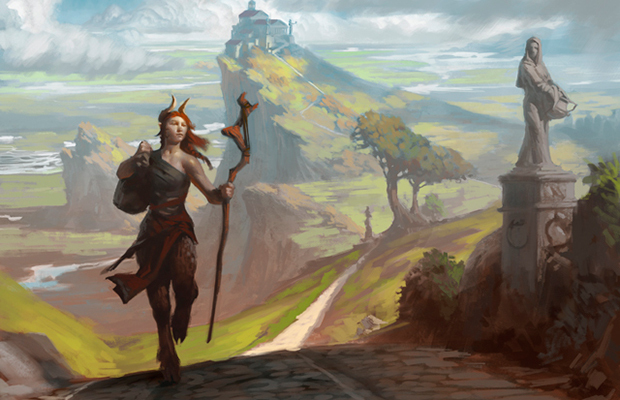 He started with Wizards of the Coast in July of 2013 as a digital content specialist for mtgo.com and contributes creative content to Magic whenever he has the opportunity. "Thank the gods!" the red-faced midwife exclaimed as Raissa's son began to emerge. The baby fought Raissa savagely as she pushed. He bucked with his tiny hooves, and the nubs of his new horns dug into her tender insides. Selfish! Raissa thought, imagining the boy grasping the cord and trying to shimmy back up its length to hide behind her heart. As she struggled, her anger grew. At three months into the pregnancy, the midwife had announced that there would be twins, a divination that puffed her up like a haughty hen. But Raissa had already known this; the starfish had revealed this to her. It was also the starfish that showed her that one twin was a boy and one was a girl. Raissa had visited the briny tidal pool often as she carried the twins. She gingerly picked her way down the jagged cliffs, her small hooves slipping on pebbles as she clung to the stones, inching toward the blue-green shore where she consulted the magical creature. Along the way, she collected clams to place in the pool next to the opalescent creature. The offerings made, its scintillant spiny surface swirled in a beautiful and mesmerizing dance until she tasted salt and felt herself floating like a mote in the pool, the starfish looming gargantuan before her. Looking up at the watery surface above her, images formed on its rippling underside, showing her visions of things she could not otherwise know. At five months, Raissa saw in the vision that the boy was outgrowing the girl, although this was something her own body told, a maternal foreknowledge that permitted her a small sense of power in her life that had become all but commandeered by the needs of her unborn children. At six months, the watery vision disturbed Raissa greatly. Floating in their womb-world, the wriggling boy crowded the tiny girl, forcing her into deep recesses. The girl shrank in the boy's overbearing presence until he completely eclipsed Raissa's view of girl. Shocked, Raissa kicked toward the surface of the dream, breaching it like a panicked fish. She lay gasping in the harsh white light and air of the shoreline. After several minutes, she gathered herself and stumbled home, massaging her swollen belly and feeling only the presence of one child within her. Two weeks passed, and she could no longer resist returning to make offerings to the starfish to peer into the secrets within her. Now, a single child swam inside her, a fattened boy growing large in the stolen space. He seemed to dance in her belly—yes, she could feel him cavorting within her, full of glee, as she floated in the vision. Raissa was not disturbed by this, however; in fact, she felt a surge of pride—pride in her son's tenacity, his unfettered exuberance, and his strength. Raissa began to sway to the rhythm of his triumphant kicks. 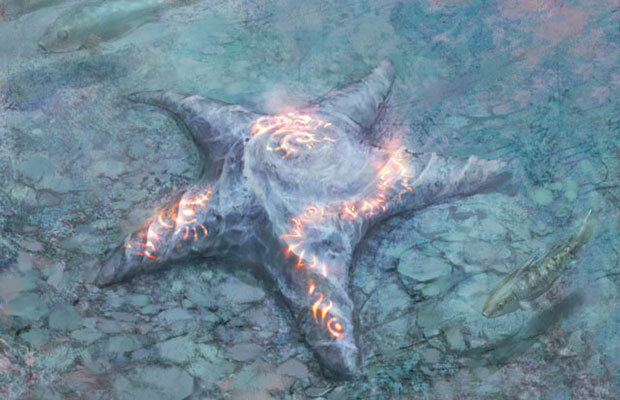 At eight months, the starfish's dancing silver sigils shifted in color and wove a dream of incomprehensible breadth, drenched in waves of verdant green and splayed fans of fiery red. 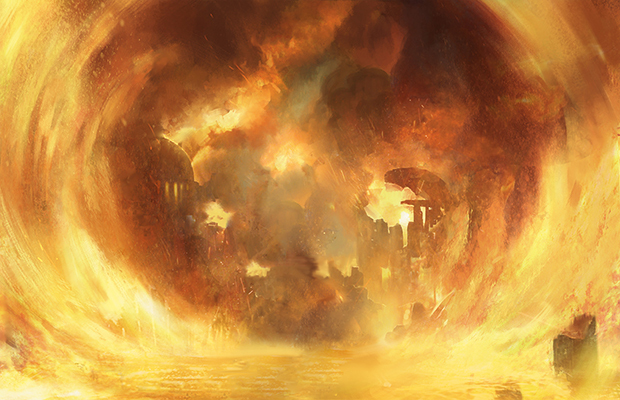 The vision pulsed with places she had never seen, places she understood that she would never see—fantastic and foul places that were no part of Theros. The worlds spun like a child's mobile around her son, who stood defiantly at the center, now fully grown. His haunches, fleeced in wiry auburn fur, flexed like a charging bull's. Thick horns curved from the back of his head, a mighty coiling crown of bone. The vision overwhelmed Raissa with its staggering portent. Her son would be a king! Again, pride washed through her; however, this time, down deep in the dark trenches of her mind, a cold current flowed. At last, Raissa felt the child relent to her increasing frustration and anger. That anger gave her strength, which she used to finally expel him, howling, from her body. The midwife's placid expression darkened as she pulled the baby and it kicked at her. Raissa's anger quickly dissolved into love when the midwife, cursing under her breath as she lifted the squirming child and struggled to swaddle him, finally thrust him into Raissa's arms. "Thank the gods," the midwife muttered as she turned and hurried from the room. Raissa's silk robe clung to her skin, soaked and cold with exertion. She shivered, and she called out weakly for the midwife to bring a blanket, but the woman was already beyond earshot, having disappeared into the cellar to drink from the Setessan Order of Midwives's store of symposium wine. Raissa lay on the straw mattress, exhausted, and considered her situation. She had sought the assistance of the women of Setessa when giving birth. Most satyr women, once sufficiently recovered, would simply abandon their children to the care of Setessa and return to the carefree revels of Skola Valley, the satyr home. Her sister had done just that when she had become pregnant. Should she do the same? Raissa looked down at the pink face of her boy and knew she could not. This child was special, and he would need her to fulfill the destiny she had witnessed. She hugged the child close. "Thank the gods!" her neighbors exclaimed, when Raissa staggered from the burning house, her six-year-old son in her arms. They rushed to her and took the boy from her arms as she collapsed, coughing convulsively, her silk robe seared and smoking. "Thank the gods," they repeated, and Raissa clenched her teeth. The gods, indeed. Raissa wanted to rebuke the people who offered those thanks, the same people who whispered about her and her child when they thought she could not hear. And what had the gods done for her, except curse her with this nearly feral child she could not control? He had caused them to be cast out of Setessa when he shoved the son of one of the Karametra temple's ruling council to his death from a high rope bridge among the trees. But Raissa could only gasp and cough up blackened fluid. I should have left him and returned to the Valley, she thought bitterly. When she had her breath again, she climbed to her feet and snatched the boy from their arms. She turned and limped with him down the road, still coughing, leaving the muttering of the crowd behind her. "You are strong," said the boy. Raissa looked down at him. He smiled up at her, blinking soot from his wide, bright green eyes. Once again, Raissa's anger toward her son drained away, and love swelled in the space. She pried from his small hand the charred, oil-soaked tinder he had used to set her bed alight while she napped and tossed it away. After an hour of walking, despair settled over Raissa. She placed the boy on the ground and rested, watching as he clopped off to play near the trees at the edge of the road. She had no place to go, now. She had been walking with no destination in mind, and sunset was only a couple of hours away. Where would they sleep? The boy, now wielding a sharp stick like a sword, leaped back and forth across the ditch at the side of the road. What would they eat? 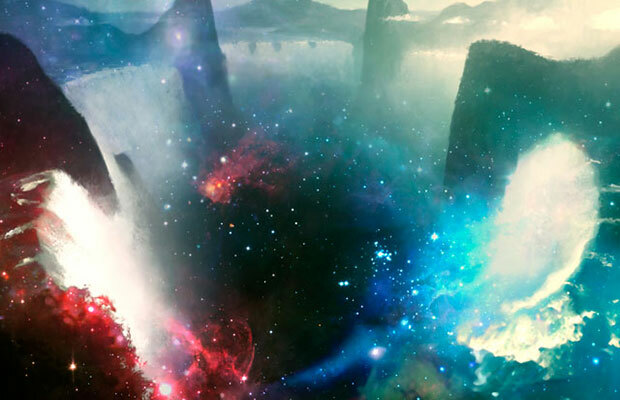 Raissa looked up for an answer, almost out of habit, as if she would see there not the vault of Nyx arching above, but the rippling reassuring dreams of the starfish's visions. There was only the empty meaningless sky. Am I punished because I do not pay tribute to the gods? Raissa knelt where she stood. "Is this what you want?" she asked the open air. She closed her eyes against the unsympathetic stare of the heavens. She clasped her hands together. "Would this satisfy you, to show you that you have broken us?" Raissa listened to her son humming and leaping at the edge of the road. "Shall I submit?" she said, more quietly. All was quiet. Then, she heard her son next to her shout, "Strong!" The boy struck her in the side of her head with his stick. Pain burst behind her eyelids, white and searing, and she cried out. He scooted away, giggling. A warm trickle oozed down the side of her face. Raissa did not know the path forward for herself or her son, but she knew where she could learn it. It had been a year since she visited the tidal pools. She hoped the starfish would still be there, although it had been so long she worried that it had moved on to other pools in search of sustenance once her offerings of clams had stopped. Raissa picked her way carefully down the cliffs, while her son hopped and skittered and laughed his way down ahead of her. At the shore, she showed him how to search for clams. They gathered several, and she led him over weathered stones to the secluded tidal pools. She checked the pool she had always visited, but the starfish was gone. She searched the other pools, going farther and farther out from the first one. Then, in a shallow depression near the edge of the rocky ground, she found the starfish. It glinted silver and orange in the long evening rays of the sun. Raissa placed her clams in the pool around the starfish, and her son did the same. His large eyes widened as the starfish shifted, and its surface flushed with green and red. Together, Raissa and her son floated into the dream. She saw a night sky above her, Nyx itself, full of constellations that glided about with a life of their own. They flirted with, welcomed, threatened, and retreated from one another in a mighty drama that amazed Raissa. Then, it all stopped. The constellations, their elegant movements arrested, hung motionless before her and her son. Slowly, their heads turned. They faced Raissa—no, they were facing her son!—and outrage flared in their eyes. Their mouths opened, and in unison their withering voices erupted in a terrible chorus of condemnation. They raised their weapons. Their hands filled with storms, and lightning arced from their fingers as they advanced on her son. Raissa reached out to grab her son, but he was not there. 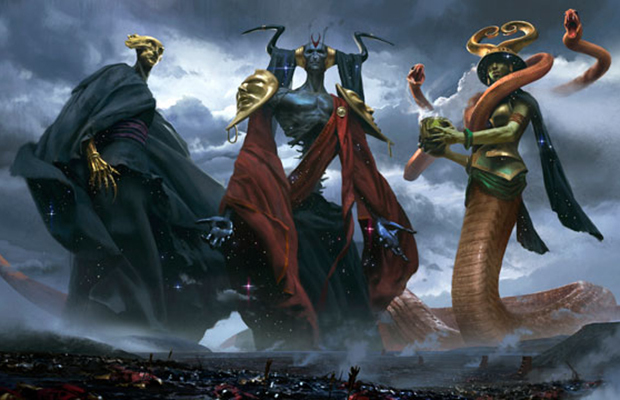 She saw him, ascending on a roiling cloud of acrid red and green power toward the advancing ranks of the empyreal host, in his grip a gleaming staff. Raissa recoiled and covered her face. The vision went dark. She tasted salt and something metallic in her mouth. The darkness lifted. Her son was laughing, a harsh laugh that seemed full of spite and embers, not the bright innocence of a child. He held aloft his sharp stick in a victorious pose. A glistening gray ichor trickled down the length of the stick, down his arm, and dripped into the pool from his elbow to make dark clouds in the water. At the end of the stick writhed the impaled gray body of the starfish.